Exploring, etc - A new outdoor adventure business! We offer outdoor adventures to help you learn the skills to explore. Please get in touch and let me know what I can do to help you get exploring! ...more than we could chew. I hacked my axes into snow which gave way like cotton wool. With neither axe taking any weight I pushed up on my feet and delicately stepped forward up the gully. Earlier, at the foot of Curved Ridge, we found ourselves with quite a few other groups of climbers. Someone had the brain-wave to climb D-Gully and then traverse right, onto the ridge, higher up. From below it looked like a straightforward snow plod, albeit in quite deep powder. It soon transpired that the powder bashing was the least of our worries. The gully was lean of snow exposing several steep rock pitches. 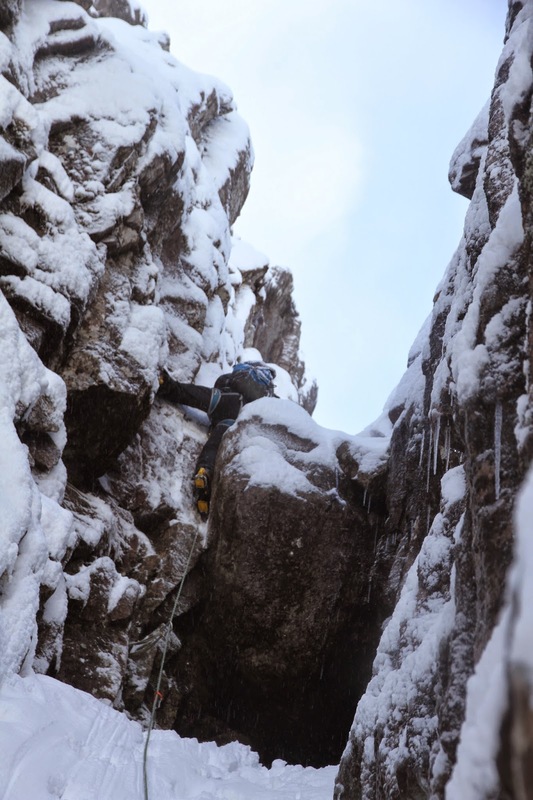 Neil faced the first one and passed it with a brief excursion left onto D-Gully Buttress. I took on the next two together directly, managing to dig out pretty reasonable axe placements. Neil again took over above that on a steep section of loose stone and an overhanging shelf of rock. Ben looked concerned. With much grunting and swearing Neil hauled himself over the ledge and set up a belay. Next Ben, on a tight rope, tackled the climb and I followed. As I caught my breath I looked at my watch. 1 pm. It had taken us an hour to climb about 20 metres. It's always slower climbing as a three but we were going way too slow. We hadn't even joined the ridge. I looked further up the gully, hoping there'd be no more difficulties. Instead I saw an enormous chock-stone. It was my turn again at the sharp end and I climbed up to the pitch. The snow in the gully had receded from the rock leaving a 10 metre deep hole. A narrow patch of snow jutted out into the hole. I made my way across it a cheval. Then, on a sort of snow podium, I stood up. From here I could just reach a small pinnacle that I could put a sling around. This buoyed my confidence enough to step across onto the rock and look for axe placements in the rock. There was a narrow crack and I hooked my axe on it. It felt solid. I hooked the other axe on it. I was now leaning out. I stepped up on to the pinnacle with sling on it and pulled on the axes. Then, for a moment I felt doubtful and stepped back down to the relative safety of the snow podium. I recovered my composure, and looked down at the others. The prospect of a long down climb back down the gully wasn't appealing. I tried again. This time I pulled hard on the axes. I stood on the pinnacle and had time to place a friend in the crack. From here it was a case of thumping my axes into soft snow and smearing crampons off the rock wall. Somehow I ended up on the shallower snow slope above, found a belay, and brought up the others. Now it looked like the gully would be easy. We plodded up higher but wasted further time finding a route back on to the ridge. By the time we had traversed right to the ridge it was about 4 pm. We were only about halfway up the route. We discussed continuing but eventually made the smart call to descend the ridge. Our descent was reasonably straightforward but on several steep sections we abseiled. The anchors were never brilliant (Ben's prussik cords) but they held. We reached Easy Gully and by the time we got down to the Crowberry Basin it was dark. When we arrived back at the car it was 8pm. We were all exhausted and felt like we'd had a real epic. The moral of the story seems to be not to bite off more than you can chew.